In a plan to expand your business, every online entrepreneur needs best Email Marketing Services. Email marketing is a kind of direct marketing that employs electronic mail for communication purposes. This services are used to send ads, solicit sales, donations, request business and others which help to build trust, brand awareness and business loyalty. 1.Madmimi - This a simplest way to generate, track and send proficient emails. 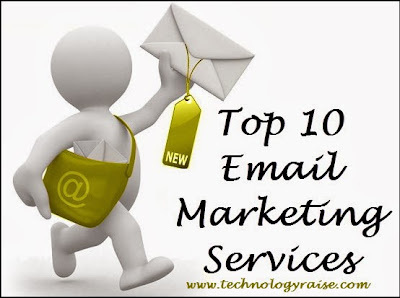 This website offers many prevailing email marketing services and tools for website owners and email marketers. Some of those tools and services include email templates, social network CRMs, webforms, social tools, etc. 2. EmailBrain - Emailbrain is a helpful site that offers simple online marketing tools like tracking function, email marketing tools, superior list managers, expert newsletter sending features, social media marketing tools, special types of templates, and many additional features. This website offers best Email Marketing Services for bloggers and online marketers. 3. VerticalResponse - Simple email marketing service that allows you to send professional emails fast. The website offers some potent email marketing toolsand over 700 email templates and potent tracking option. 4. iContact - Very useful service for online marketers as they send some professional promotional emails to their email subscribers effortlessly. It also presents social media marketing tools which are useful to generate trouble-free sales from social networking sites such as Facebook. 5. Benchmarkemail - Benchmarkemail presents simple email marketing tools along with expert templates and potent result tracking opportunity. This is a wonderful service for email marketers. 6. Constantcontact - ConstantContact email marketing service assists small business holders make sales from the emails. Very helpful service which facilitates you send professional emails for several online marketing functions. social campaigns, online listing feature, online surveys and event tracking option are the various services offered by ConstantContact. 7.Sendgrid - To help its users to send attractive and customizable emails, this email marketing service is used. It even provides a free plan to check their service. Users can send nearly 200 emails per day. 8. Getresponse - Getresponse presents great auto responder and email marketing software that can be utilized to send professional emails at an affordable price. Getresponse puts forward many valuable services that can enlarge your marketing performance effortlessly like- social sharing buttons to newsletters, easy form builder, landing page creator for promotional products, email creator, responsive design, list booster to import contacts easily, inbox previewer, auto responder. 9. Pinpointe - Pinpointe offers wonderful email marketing services to its customers. One of the interesting fact about this is, it allows its customers to send nearly 200,000 emails a month. This site offers a cost-effective and distinctive feature pay-as-you-go plan, to limit their expenses. 10. SalesNexus - SalesNexus provides email marketing services and online crm and email marketing by offering three 3 pricing options with package prices varying from 55 USD to 75USD. By this, subscribers can send nearly 50,000 SMS per month. Hope this article will help you in finding best Email Marketing Services .Thanks for Visiting Technology Raise and spending time in reading article. Post your comment below to share your ideas and experience with the above mentioned services.